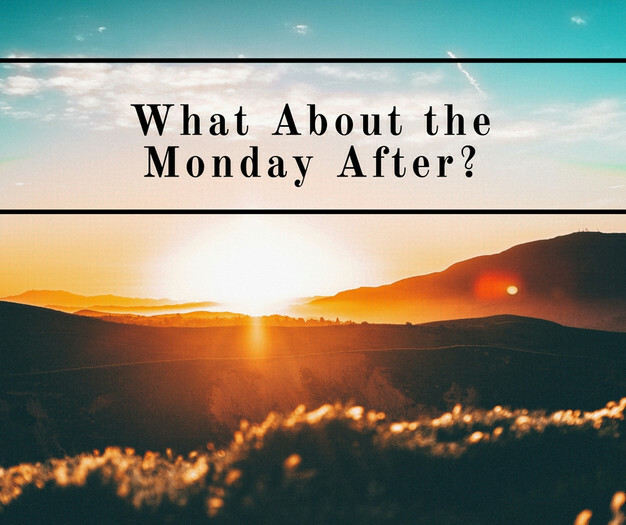 What About the Monday After? I’m sure that the first Easter was an exhilarating and exhausting day, bringing some terrified disciples into a place of hope-renewed and fearful worship as they heard the news that Jesus was alive. Jesus pulled off Easter! But have you ever stopped to think about how they felt the day after? In a matter of four days, they had seen Jesus tortured, mocked, and crucified. They saw his body laid in a tomb and sealed shut. They saw his empty tomb, and some of them saw him in person. And now they are sitting there together on Monday trying to figure out what life will look like now that Jesus did the impossible and put death back in its place. I can’t find the verse in Scripture that mentions the Monday after Easter. So I can’t say with any certainty, but I can speculate based on what I think I would be thinking. And what would I be thinking? What feelings would be going through my soul? What about you? I’m not writing this post to share what we SHOULD be thinking or feeling. I’m merely throwing out an idea that popped into my head last night. Fun to think about as we try to put ourselves in the overwhelmed sandals of Christ’s first disciples. So what would you be thinking? What feelings do you think you would be feeling? And then may we dare to move forward with reckless hope and unchangeable trust in the God who can do much more than we could ever ask or imagine: even pulling off Easter.